For our Mongol Rally trip we will drive through 20 different countries, visiting very remote places like Pamir Highway which bordered Afghanistan. Nobody want to get sick while traveling, especially for this trip of the lifetime. Below is a list of vaccinations recommended by Centers for Disease and Control Preventions (yes we type in each countries one by one and aggregate the results below), hope this information is helpful for any future travelers ;-) We added the Tick Borne vaccines too because we are going to camp out a lot, but unfortunately it is not available in the U.S. 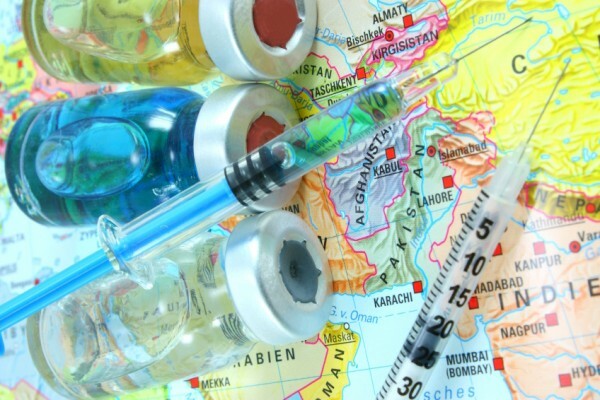 According to CDC, the countries that listed the most vaccinations needed are Turkey, second is Tajikistan. Only Turkey requires Polio, only Russia requires Japanese Encephalitis, and Turkey, Azerbaijan and Tajikistan all requires Malaria. Depends on where you are from you might already have the “routine vaccines” from your childhood immunization shots including MMR, DTap-ITV, HBV…etc. (Kenneth is from Hong Kong he found this chart that compared U.S. and U.K. child immunization) e.g. If you already had 3 HBV shots you are already have lifetime immunization against Hepatitis B.
Here’s our route for your reference. Young and Kenneth decided to only take the following 3 shots: – Hepatitis A, Typhoid, Japanese Encephalitis. *note: Tick-Borne Encephalitis (TBE) is not available in U.S.A. but available in Canada and other European countries. For Rabies we simply don’t have enough time to do it- 3 shot vaccine (days 0, 7, 21-28) and we decided too late. Polio (Turkey only) You may need a polio vaccine before your trip to Turkey, especially if you are working in a health care facility, refugee camp, or humanitarian aid setting. This kind of work might put you in contact with someone with polio. If you were vaccinated against polio as a child but have never had an additional dose as an adult, you should get an additional dose. Adults need only one additional dose in their lives. If visiting Turkey with children, it is especially important to make sure they are up-to-date on their routine polio vaccinations.